See how Nicker Notes can help you better manage your horses. 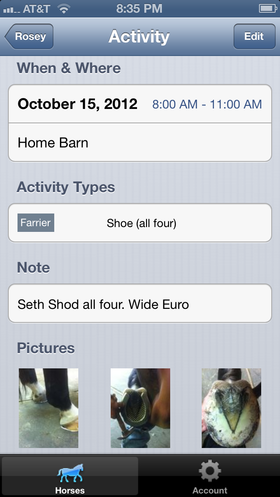 Get the overall picture of what’s going on in your horse’s world with a monthly activity calendar view. 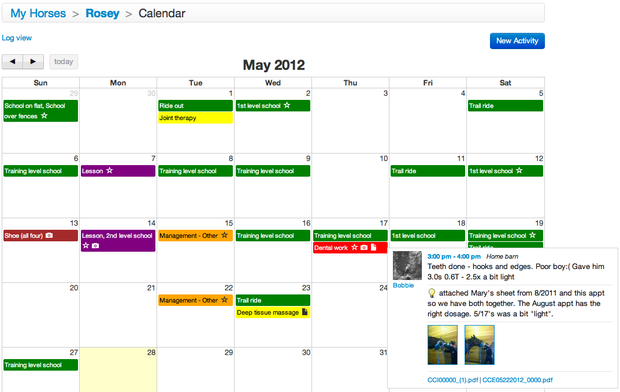 Color coding makes it easy to find particular activities at a glance. Quickly drill-down and view activity details including notes, photos, and attachments. 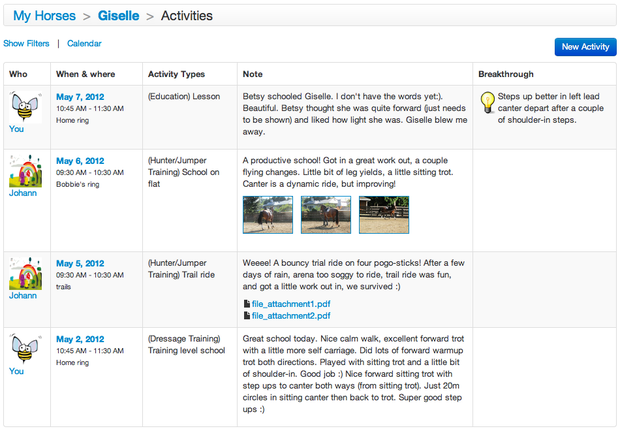 Track and record your horse’s activities in a chronological journal. Each activity includes date/time, category, location, and notes, plus optional photo and file attachments. Filtering capability lets you easily find the records you’re looking for. 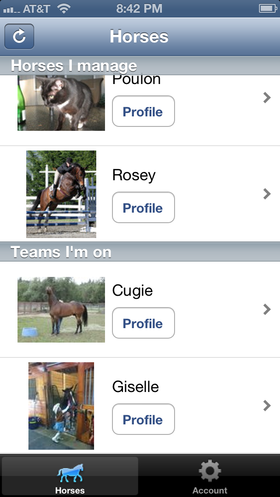 View and manage your horse’s information in one place. See who’s on the team and invite new members. Your trainer, vet, farrier, and other service providers can add key info to your horse's profile, so everyone has the knowledge they need to best care for your horse. Get deeper insight into your horse's activities over time. Simple charts and graphs break down activities by category, volume, and timeframe. Understand if your horse is on the right path to achieve the results you're after. Stay connected with your horses when you're on the go. View and record activities including photo upload so you capture those important moments. 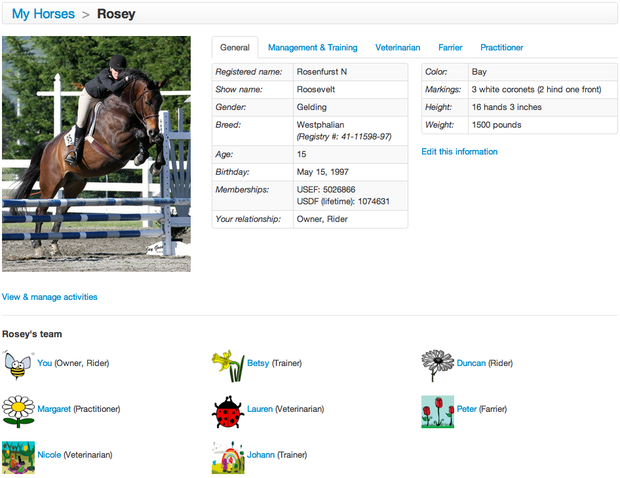 Lookup horse and team member info in a flash. iOS available today, Android coming soon! View supported features. Daily and weekly views of all planned and completed horse activities. Track progress of turn-out, training rides, lessons, etc. 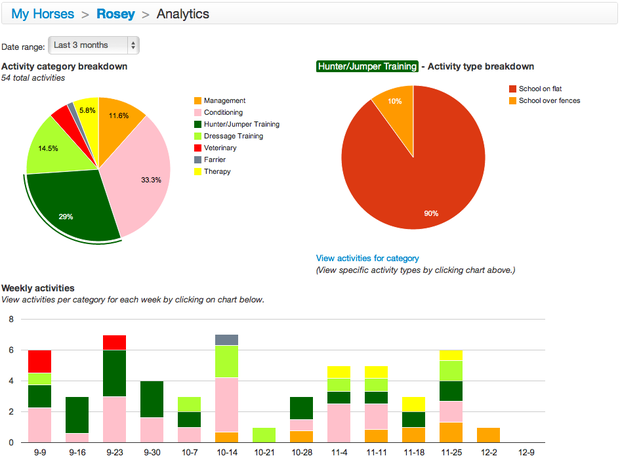 Easily plan and assign future activities to staff members or service providers. One view to see what’s been done and what's upcoming across all your horses. Integrated with each horse’s activity calendar and journal. Manage your customer schedules in one place. Publish upcoming shows, clinics, lesson blocks, and meetings. Customers can sign up for events, lessons, schooling times, clinic sections, show arrival / departure times, and more. Secure customer login to view their own and other barn member's schedules on the web. Build a community around your barn. Share the latest news and happenings with customers, staff, service providers, or the general public. Enable staff and customers to do things like plan barn social events, advertise tack for sale, or organize shared rides for upcoming events. Share information with the right people at the right time. Control which information and activities are visible to individual staff, service providers, and customers. Subscription-based activity notifications let barn members with permissions know about relevant updates in real-time.